If you operate a bar, sports bar, or casual restaurant, game days offer excellent opportunities to pull in a crowd. And with football, baseball, basketball, hockey, soccer, and more, you’ve got these opportunities throughout the year, so it’s smart to take full advantage. Your guests have their pick of where to watch the game (now more than ever, according to Nation’s Restaurant News), so, why will they choose you over the guy down the street? If your tabletops are on-trend and you’re serving up presentations that no one else can touch, the question becomes why wouldn’t they choose you? 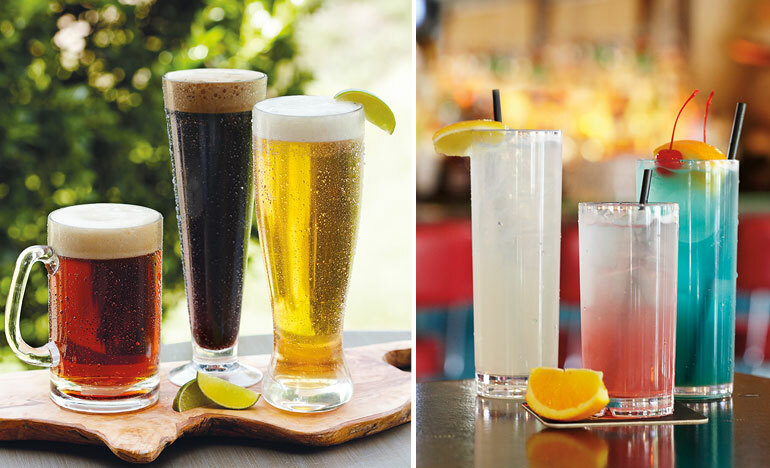 You can count on serving drinks for hours on end every game day (and night!). That’s why barware is the perfect tool to set your operations apart from the competition. 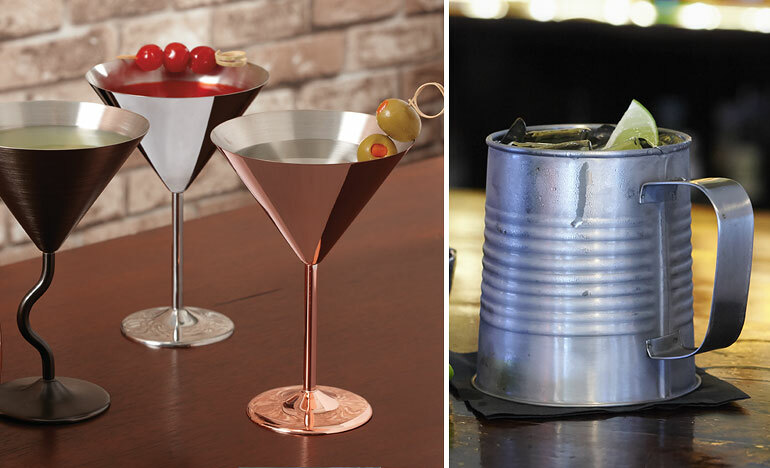 Featured: New metal drinkware in copper and stainless steel. Request a sample. To stay trend-forward in 2018, you’ll definitely want to focus on metal barware that’s hitting the market (get an in-depth look at the trend in 2018 Barware Trends for Foodservice). You can find a range of different drinking glasses to serve anything from the usual beer, wine, and liquor to specialty cocktails and martinis. You’ll delight your guests with the unexpected style. And metal drinkware won’t shatter like glass. Featured: (Left) stainless steel and copper martini glasses, (right) stainless steel mug. Request a sample. With different textures, tones, and finishes, metal barware is raw and edgy, which is perfect for the sports-loving crowd. The style is flexible enough to mix and match different pieces for a dynamic look. You can also dress it up or down to fit upscale or casual atmospheres. 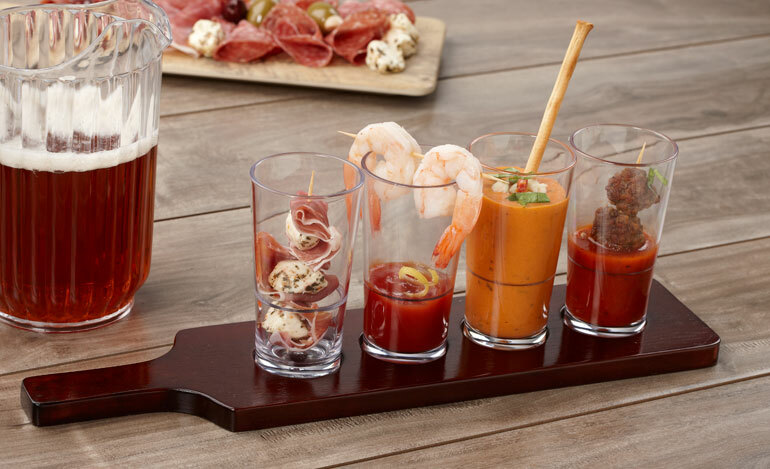 Featured: Taster paddle in wood, mini pilsner glasses. Request a sample. 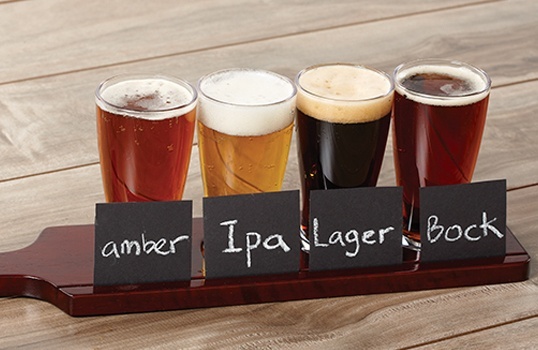 Not only do wooden flight boards offer your restaurant or bar a trendy look, but you can use the same setup to serve a few different menu items so you have less tableware inventory to manage. Featured: (Left) 12 oz. beverage glass, (right) 9 oz. rocks glass. Request a sample. Thanks to advances in manufacturing technology, today’s plastic drinkware features excellent design, clarity, and weight similar to glass. In fact, you’d be hard pressed to tell the difference visually between plastic and glass when you buy from a reputable manufacturer. Featured: (Left) 20 oz. beer mug, 16oz. pilsner, 22 oz. pilsner, (right) 16 oz. high ball, 14 oz. Tom Collins, 9 oz. high ball. Request a sample. 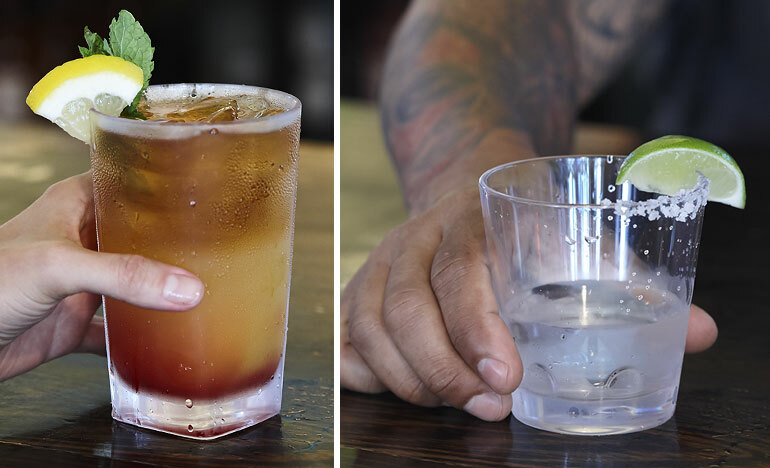 Even better, it can save you money because glass barware is replaced 50%-100% more often than plastic. And If you offer patio service or your guests get a little raucous when they cheer for the home team, plastic drinkware won’t disrupt operations if it’s dropped because it won’t shatter like glass. Not to mention, plastic reduces potential guest and employee injury risk. Take advantage of your game day crowds by adding a custom logo or design to your drinking cups, plates, and food-safe paper liners. Most minimum order quantities, or MOQs, are within reach in terms of investment and turnaround time for the majority of restaurants and bars. 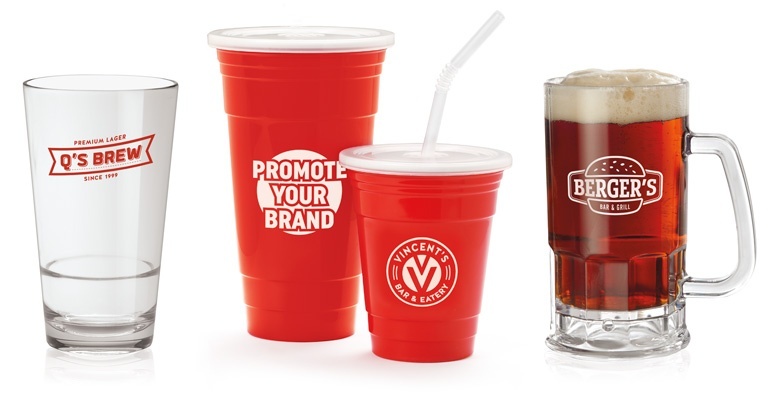 Featured: custom branded 16 oz stackable pint glass, reusable tumbler with lid and straw, 20 oz. plastic beer mug. Request a sample (products only, custom artwork samples only available when artwork is submitted).. 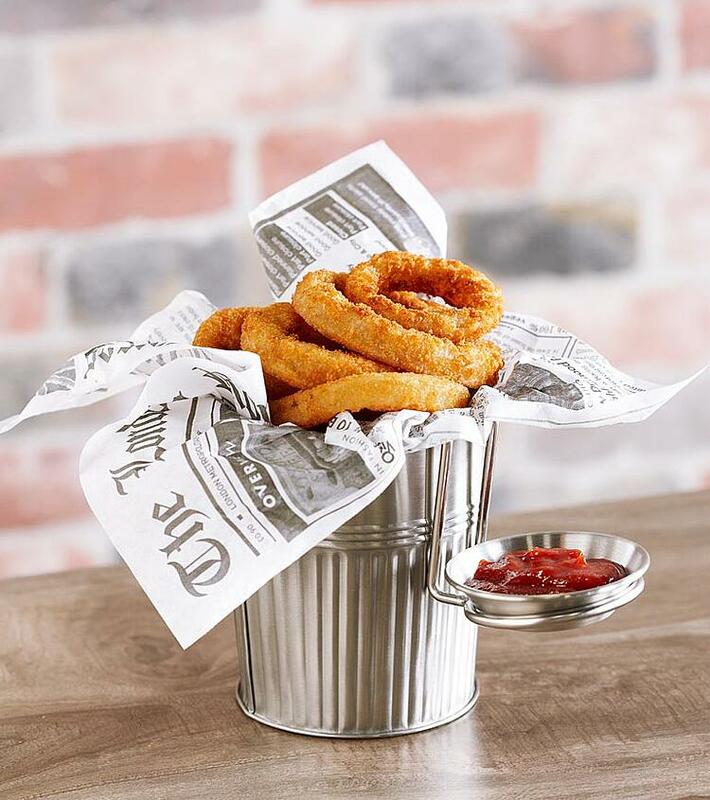 Featured: food-safe paper liner with sports design (contact us to customize your own design), wire basket with places for two sauce holders, 2 sauce cups. Request a sample. Consider the average cost of a 30-second prime time TV or radio commercial. Depending on your market, you may invest a few hundred to several thousand dollars to reach a somewhat targeted audience for half a minute. But on game day, if your guests stay for most of the game, they’ll be in your establishment for at least 3 hours, if not longer. You could invest a few hundred dollars on custom logos or designs and advertise to the most relevant audience possible (they are at your restaurant, after all) for a couple hours straight. Better yet, you can enjoy the benefits of custom branding year-round with only a single investment. But if you advertise on TV or radio, your campaign length will typically only be weeks to months long. For your guests, game days revolve around celebrating the home team and indulging in hearty dishes like wings, nachos, pizza, chili cheese fries, and hot dogs with reckless abandon. 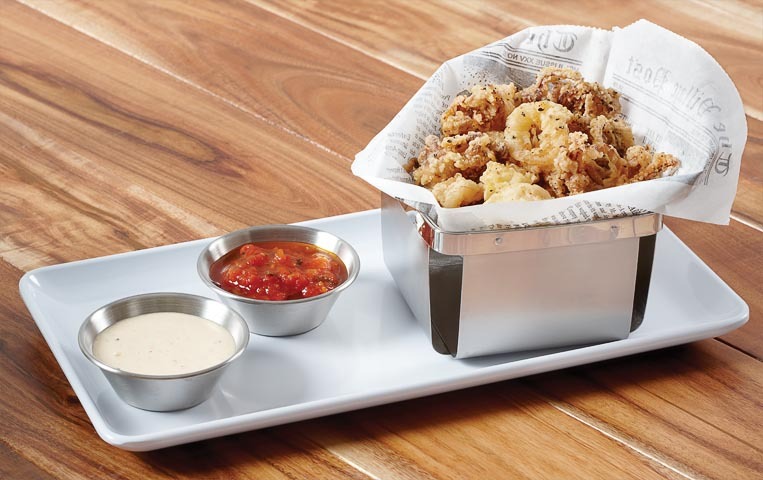 Featured: white melamine plate, metal appetizer basket, 2 oz. sauce cups. Request a sample. For fried appetizers like nachos or chili cheese fries that work better on a flat surface, consider using metal trays. You’ll still tap into the metal trend and exceed your guests’ expectations. To complete the look, line any of these items with fashionable food-safe paper. Forget overused plain white or brown kraft paper. Your operation is more interesting than that! Instead, look for food-safe liners with typography, colorful checkers, and even burlap designs. Featured: Stainless steel French fry cup, newsprint food-safe paper liner, sauce cup holder, sauce cup. Request a sample. You’ll blow your guests away, serve the same food you always do, but enjoy a better profit margin, more repeat game day business, and improved social media love. Featured: Heiss™ Minis in red and black. Request a sample. If you’ve always liked the look of miniature enameled cast ion vessels (and who doesn’t?) but couldn’t afford them or found them too heavy to be operationally practical, we have excellent news. There’s a new alternative on the market made from cast aluminum, and it’s a fraction of the weight and cost. 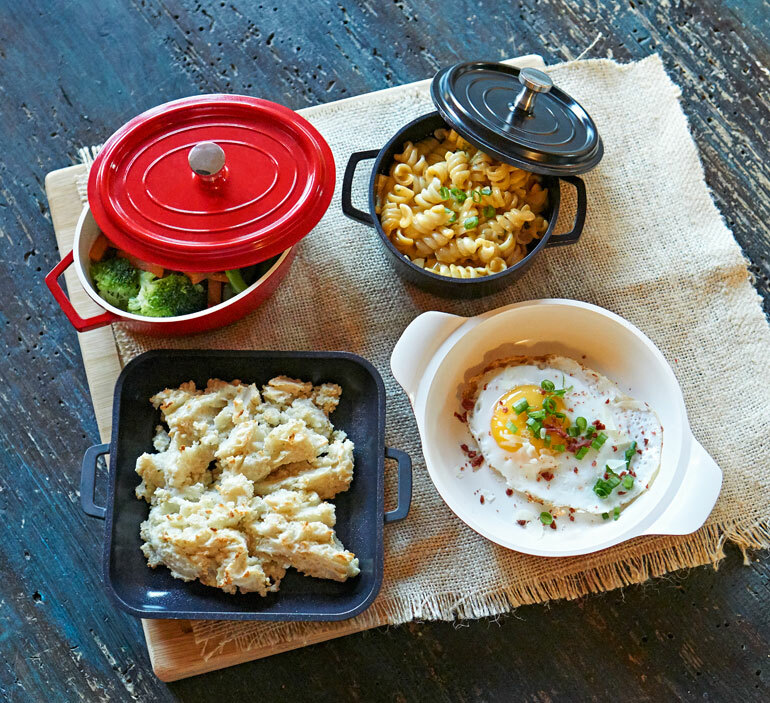 These mini dishes are perfect for hot side dishes like mac ‘n cheese, Brussels sprouts with bacon, loaded mashed potatoes, creamed corn, chili, etc. They’ll fit smoothly into menu items you’ll already sell in high volume on game day. It’s a simple, affordable plating change that allows you to instantly upgrade the whole look of your presentation. Drawing on the raw materials trend for 2018, wood is gaining popularity as plateware. Some operations choose to use real wood, but it’s expensive, heavy, and often riddled with sanitary issues when used to serve food. 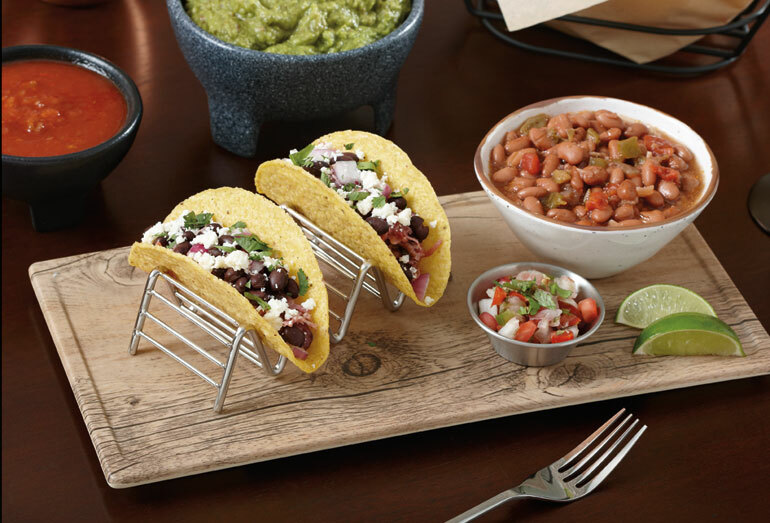 Featured: faux oak wood display, taco holder, metal sauce cup, 22 oz. irregular bowl. Request a sample. 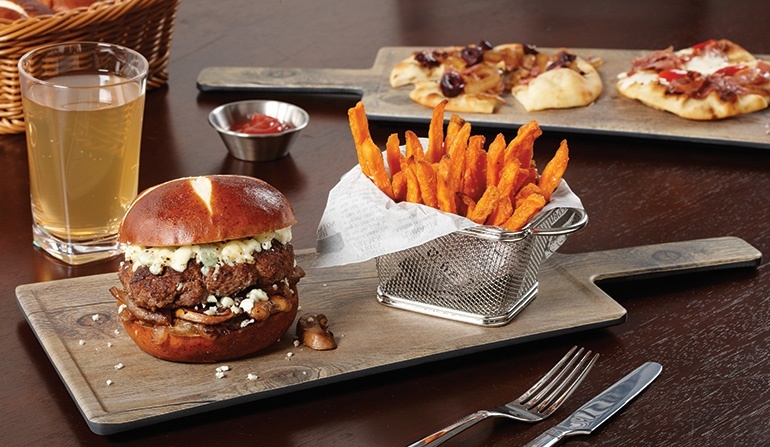 Faux wood made from melamine solves for every issue that real wood creates, and they're a great match for serving burgers, sandwiches, personal pizzas, tacos, ribs, sliders, and more. You can pull in some cups, cones, or mini cast aluminum vessels to round out your presentation for a complete, on-trend look. 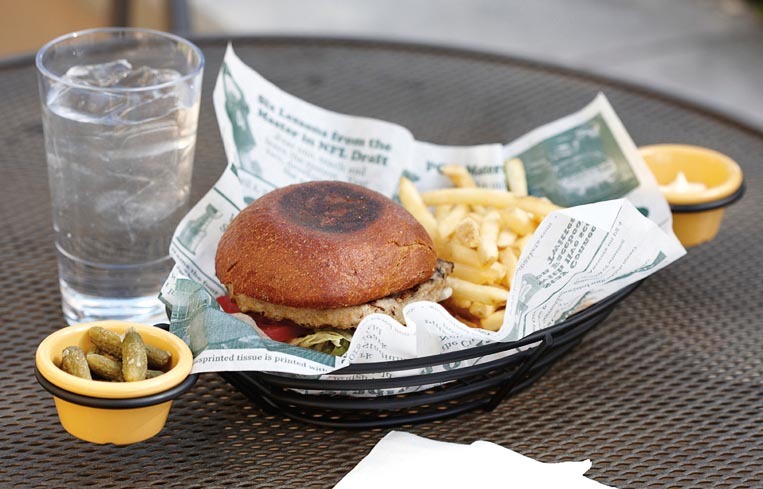 Featured: faux oak wood board with handle, French fry basket, double-open food-safe paper liner with newsprint design. Request a sample. Perhaps the best news of all is that these ideas are affordable, minor changes that will help you make a big impact on brand perception and guest satisfaction without requiring any major operational adjustments. It’s a win-win for you and your guests. At G.E.T., we’re all about helping our customers transform their tabletops by understanding their business needs and offering relevant ideas to improve their operations. That’s why we created our sample request program, which is quite liberal with most pieces available free of charge for commercial entities. And when you’re ready to place your complete order, we’ll typically ship it in 24-48 hours. When you work with G.E.T., you also benefit from dedicated customer service professionals who are there for you before, during, and after your purchase. If you’d like to chat with us for recommendations or answers to any questions you may have, we’re ready for you at (800) 727-4500 or interestedingetproducts@get-melamine.com.